Add 80 fps Muzzle Velocity to Your Ruger Air Hawk Air Rifle for Just $12.99! 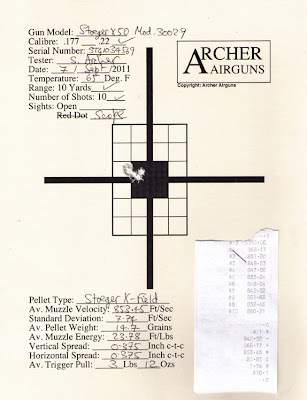 I increased the muzzle velocity of a Ruger Air Hawk air rifle from 806 fps to 886 fps, simply by installing the Archer Airguns XMV Tune Kit and you can do the same! Below, the Archer Airguns XMV Tune Kit. The Ruger Air Hawk air rifle is a pleasant, accurate air rifle that's widely available at excellent prices. But, analysis by Archer Airguns indicates that the vast majority of these guns are shooting significantly slower than they should. This is also true for the Ruger Blackhawk, Ruger Air Hawk Elite and Ruger Air Magnum air rifles as they all share a similar design. Fortunately, the Archer Airguns XMV Tune Kit provides a way to increase the muzzle velocity of the Air Hawk by up to 80 fps - that's 20% more power (muzzle energy) - using the same pellets. The best news is that it's cheap and easy to do! The following table shows how the muzzle velocity of an "off the shelf" Ruger Air Hawk was increased by using the high quality replacement breech seal and shims included in the XMV Kit. As you can see, the muzzle velocity is increased in two ways: by placing shims under the breech seal and by replacing the breech seal by a better one. 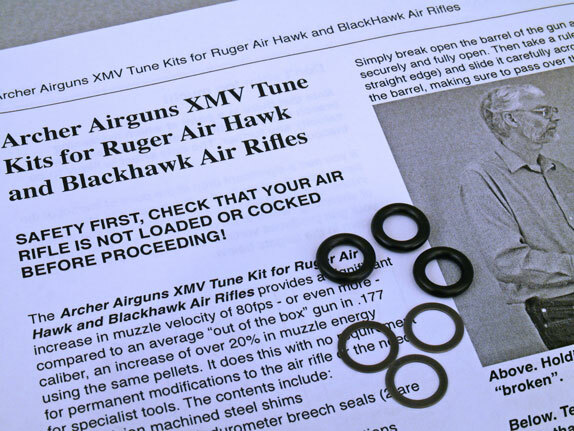 The installation instructions included with the Archer Airguns XMV Tune Kit for Ruger Air Hawk and Blackhawk Air Rifles make it simple to install the kit. No special tools are required and no irreversible changes or alterations are required to your airgun. The XMV Tune Kit includes 3 high quality, long-lasting replacement breech seals and 3 high precision steel shims that are machined to tolerances of half a thousandths of an inch. The Air Hawk uses a circular breech seal that can be seen around the rear of the barrel. This breech seal sits in a circular slot. 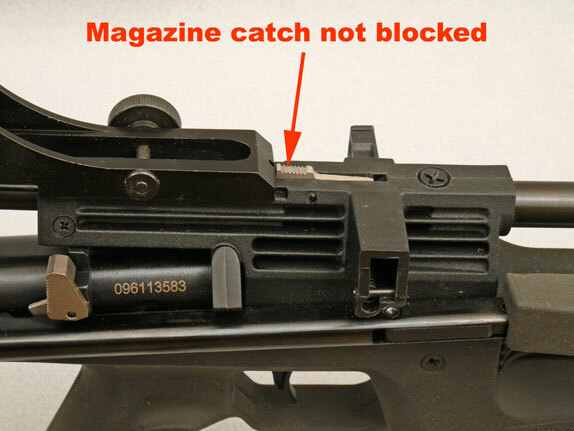 But the slot is often too deep for the seal and this allows air to be lost when the gun is fired. As that lost air should be powering the pellet, it represents a reduction in muzzle velocity. The shims and replacement breech seal included in the XMV Tune Kit eliminate that lost air and increase the muzzle velocity. This diagram shows a side view through the slot, breech seals and shims. On the left we see a very common condition with factory guns - the breech seal is below the end of the barrel. 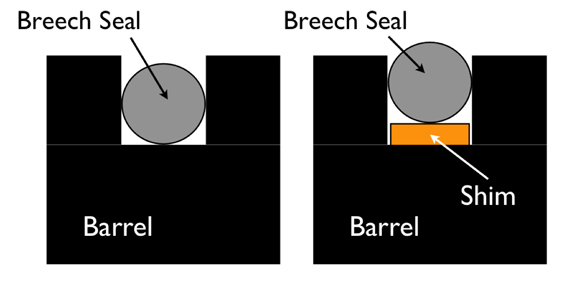 On the right is a diagram of the XMV shim and breech seal. You'll see that the breech seal now projects slightly above the end of the barrel. Obtaining the correct, slight breech seal projection - we're talking just a few thousandths of an inch - is what the XMV Tune Kit is all about. We'll cover more about this kit in future blog posts, but if you want to read the complete story right now, you can do so using the ebook I've published on the Archer Airguns XMV Tune Kit for Ruger Air Hawk and Blackhawk Air Rifles. 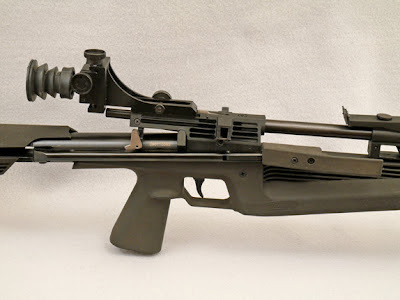 The Russian IZH 60 and IZH 61 air rifles are wonderful, accurate little guns for target shooting, but the standard open rear sights fitted to the gun leave a lot to be desired. Fortunately it's easy to upgrade the IZH 60 or IZH 61 for much better accuracy using the Industry Brand Target Aperture Rear Sight. 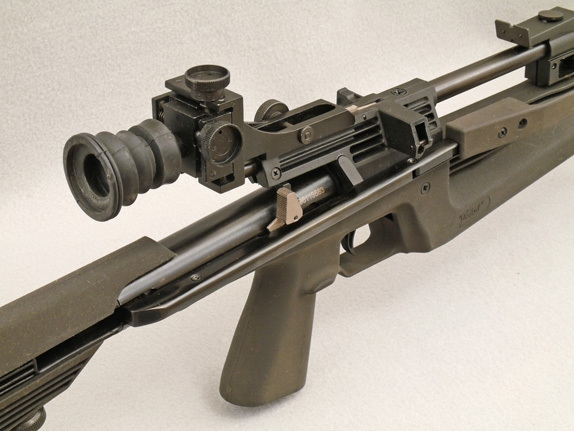 This sight fits perfectly onto the very short scope rails of these IZH air rifles, without blocking the magazine release lever of the multi-shot IZH 61 model. The Industry Brand Target Aperture Rear Sight gives precise, clock adjustment of windage and elevation and is comfortable to use with its included rubber eyecap. It also sits at exactly the right height for use with the front post sight of the IZH guns. My accuracy with the IZH 61 increased considerably once I fitted this peep sight. I'll bet that yours will, too! There's Still Time to Register for the 2012 Crosman FT Shoot! 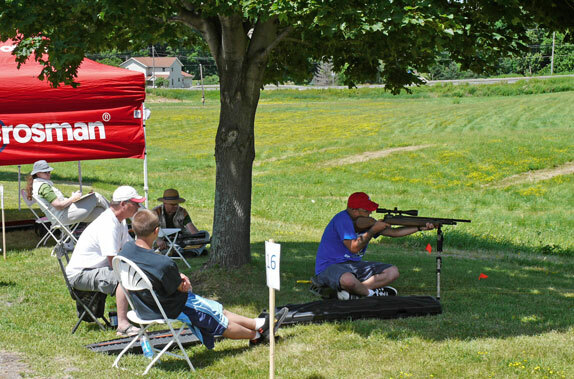 Don't miss out on attending the 2012 Northeast Regional Field Target Championship that will be held at Crosman's corporate headquarters in Bloomfield NY on 6, 7 and 8 July. Registration for this excellent event must be completed by 29 June. There's a wide variety of excellently-sighted targets placed around the grounds of the Crosman factory to provide challenging shooting. Also there's a practice range facility and an air pistol shoot. Don't think that you have to be a great shot to attend, there's a great welcome for beginners, too, and all of us benefit from the opportunity to meet other airgun shooters and have a great time. Crosman are gracious hosts - and although although I obviously cannot speak for Crosman and promise what they will do - in previous years the company has provided complimentary cold water and sodas to keep shooters hyrdated in the hot weather. There's also been a tent with chairs and tables for Lunch and as a gathering point for competitors. Also provided have been tanks of compressed air so that shooters can easily recharge their PCPs. Crosman has also provided some generous "door prizes" for attendees to win. And I believe that there will again be some Crosman products available for purchase at the shoot. For me, a highlight of this event is always the chance to tour the Crosman manufacturing facility! Among the interesting sights that we've seen in previous years on the factory tour are the noisy and complex Powerlet-manufacturing machinery, the busy 760 assembly line and the Marauder manufacturing/testing area. There's also been the chance to see how pellets are manufactured and packed. And the knowledgeable guides are pleased to answer questions. For full details and to register, check out Crosman's web site. We're often asked about how long the Duct Seal will last on an Archer Airguns "Silent" Pellet Trap. So, here are some photographs of a Premium "Silent" Pellet Trap that has been in use for about 7 years now - and which continues in use every day. 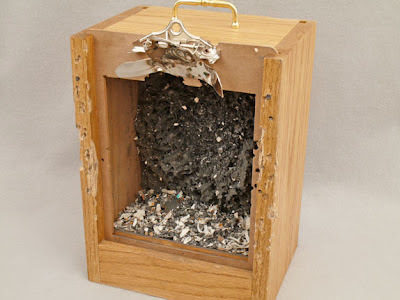 As you can see, this trap is certainly battle-scarred, but it's still serviceable and in particular the original Duct Seal or "impact putty" as it's often called is still in use and has not been replaced, in spite of many thousands of pellets fired into it. The duct seal is still pliable and has not dried out at all with age and use. 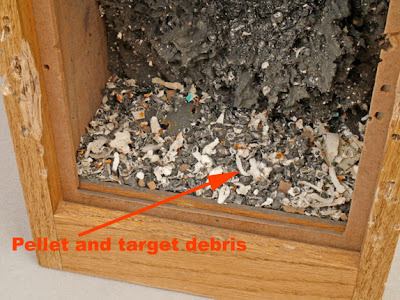 As most pellets land in the center of the trap (behind the target bull), they eventually clump up as shown in the second photograph. When the trap is full - like now - the lead clump can be carefully dug out of the duct seal and the hole filled by either pushing around the remaining duct seal, or simply by adding some additional, new, duct seal. The design of Archer Airguns "Silent" Pellet Traps allows for the inevitable target debris and spent pellets - that bounce off the lead clump - to land harmlessly in the bottom of the trap. This means that they don't fly back out of the trap, as often happens with pellet traps of other types. The photo below shows the huge amount of such debris that can accumulate in one of our traps before it requires emptying. 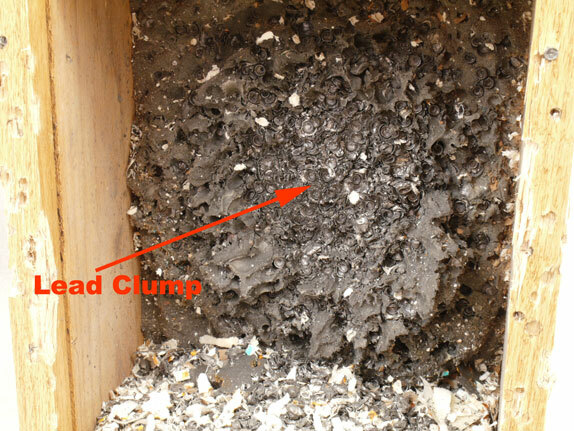 Of course, the "Silent" trap design stops that annoying, loud "clang" that accompanies the use of all metal pellet traps and - as you can see - it catches all of the dross that tends to litter the space in front of other traps. This is a great safety feature, particularly if pets or small children ever venture onto the range and take a close interest in all that stuff lying around other traps. It's still "the best pellet trap on earth"! We have a Summer Sale in the Archer Airguns store. Included sale pricing on selected QB78 family parts, on the QB78 and QB57 Deluxe air rifles and on the Stoeger X20 Suppressor and X50 models in both black and camo stocks. Here's an example of the performance that can be attained by the Stoger X50 in .22 caliber. There are also great prices on some Leapers scopes, including "Bugbuster" models. A few more surprise additions to the sale may take place in future, so keep checking back!